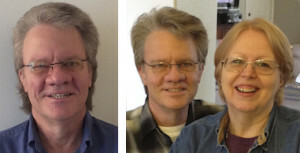 My wife Pam and I celebrated our 43rd anniversary this year. We currently work through Skype and eMail and are open to being creative in our communications. We live in a small world. We’re in the Dallas area, Texas, USA and wherever you are, you are our neighbor. Our services are available in English only. Some say a person’s words, actions, career choice, and temperament speaks volumes about their internal feelings, ease, and comfort zone. I’ve found this to be fairly accurate and accept that it may explain my desire to serve The One, our Creator, through serving my brothers and sisters for we’re all connected, one with The One. Is it that we’re helping others to help ourselves or we help ourselves in helping others? I’m not convinced it matters which it is. What does matter is if the spirit, desire, or intention is to help or to hurt. Our desire, intention, and goal for The Magic of Imagination is sharing Closely Guarded Secrets, Timeless Insights, and New Findings that can transform our life, let life exceed our heart desires. We’ll do that by developing our Personal Power. Being authentic acknowledges we are connected with The One, connected with everyone and everything, and accepts we are treasured as we are – Here & Now – loved and forgiven like a new-born baby with a diarrhea-dirty diaper. The catch is – what we give we receive! When we let acceptance, non-judgment, trust, encouragement, joy, and love flow through us to others, it returns to us as we connect with our intuition, non-judgment, confidence, direction, assertiveness, joy, love and empower ourselves with life’s endless energy. While Financial Power and Political Power are outside our control and can be taken from us by “the powers that be,” our Personal Power is ours. We own it! Viktor Frankl is an inspiring example demonstrating it may be unimaginably difficult, but no one can take it from us! Although I have experienced losing my Financial Power and Political Power through pursuing my desire to be of service, my Personal Power has only strengthened, perhaps proving what doesn’t kill us, makes us stronger. I lost my Financial Power when, as a Food Stamp Case Worker, if I discovered someone had previously received too many food stamps, it was my responsibility to recover the extra food stamps, by reducing the current allotment if necessary. On the other hand, if I discovered they had not received their full allotment, I was prohibited from telling them unless they asked, and no one ever knew they could or should ask. I did not see this as fair. I wrote a book, reviewing the rules, regulations, and assisting people in applying. After I had printed a thousand copies, the Federal Government notified the Texas Health and Human Services Department that they were not making enough information about the program available. I offered Texas my book to give to people and they responded by notifying me I could destroy my book or be fired. When push came to shove, I did not have the political juice required and thus lost my Political Power to do business. I believe families are a country’s backbone; that to prosper, a country needs strong families. Families with the monthly income they need, training, encouragement, and focus on and free time with each other, and financial security for life’s unforeseeable events. I believe most of us want to be independent, self-reliant, and to give our family a better life. I was sure a multitude of people would respond favorably to encouragement and opportunity to pursue their own “American Dream” if first they had the financial foundation of the monthly income they needed and life insurance in the event time ran out before their plans were completed. I created a program wherein without any out-of-pocket cost – now and forever – our members could have my plan. Despite having written authorization from the TDI (Texas Department of Insurance) to offer my program, when I opened business to an enthusiastic response, competitors couldn’t compete and induced the TDI to sanction me and close my business. I appealed their decision, up to The Texas Supreme Court who declared although they did not agree with what had happened, they declined to hear the case. I was a “Hot Potato” with the TDI acknowledging in Court they had approved my program; had not instructed me to stop my program; had no grounds or evidence I violated any regulation; they simply were in control and not allowing me my right to continue. But my Personal Power can’t be taken! Thus when all was lost, I chose to rely on it to maintain my inner-balance and family. It falls under controlling what one can control – themselves. All we can control, at best, is our thoughts, words, and actions in what we initiate and how we respond. By focusing on what I can control, and learning from my experiences, I’ve developed The Magic of Imagination to serve us all in developing Personal Power, the clarity for Easing into Quantum, and then the confidence for Quantum Living. Working together as well as dialoguing through blogging, we’ll utilize and develop programs, processes, and systems to work through the limitations. Skin in the game – an old limitation – is simply an old illusion, a 3-Shell game we shall expose. No, money will not be the reason to say “No” to life’s greatest adventure! If anything, it’ll be the reason to jump in! Costs are small, if any, and the financial gains from developing Personal Power, Easing into Quantum, and Quantum Living are immeasurable!